Initially settled by Thomas and James Bell who immigrated from Florida in 1822, as some of Stephen F. Austin's earliest settlers, and donated over 145 acres to Austin County. Bellville was named for them. The many markers in the area chronicle incidents from the early days of Texas, both as a republic and later as a state. 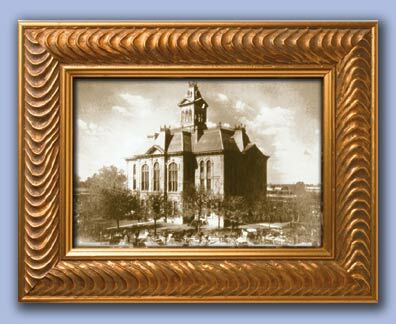 Noted with plaques are the original school sites in the county, over 170 cemetery locations (some on private property), the Austin County Jail as well as many buildings and homes located around the town square and in the residential districts. Bellville celebrated its Sesquicentennial in 1998, and we look forward to another 150 years of prosperity to come. 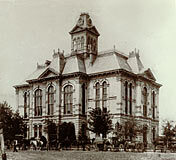 Bellville is the county seat of Austin County, and the district surveyor, Mr. D. Charles Amthor platted the town in 1846 to center around the Courthouse and town square. Churches, a log cabin, and a wooden courthouse were the first public structures in Bellville. Most of the residents were farmers, and the town grew slowly until the coming of the Santa Fe Railroad in 1880. This brought a rapid increase in population and business development. With the coming of the railroad, the population of Bellville rose from 300 people to 1,000 residents within three years. The railroad created a market outlet for cotton and other agricultural products, as well as providing transportation to Houston, Galveston, and other faraway places. Many large homes were built during this period, and commerce and government had its impact on the city. The Courthouse Square remains as it was laid out in 1846 and many of the historic buildings have now been transformed into a collection of unusual and unique shops and businesses. In 1883, there were six saloons on the square alone. Local legend tells the story that Irish immigrants were brought in to construct the railroad and bridge over Mill Creek. On Saturday nights a flatcar was used to bring them into town and later they were loaded back on the railcar (in a horizontal position) to take them back to the work camp. 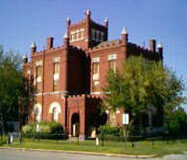 Bellville is a city rich in local Texas history. The Austin County Jail building shown above, stands a half block off of the Town Square and consists of three complete stories, plus a fourth, smaller area, know as the "gallows". The gallows was used only once. On March 14, 1901 at 2:14 pm–Gus Davis was hanged for the murder of Herman Schlunz. Visit the Bellville Historical Society website for more information about Bellville's past.